Does every organization have a disaster recovery (DR) plan? Not necessarily. Also, out of the ones that have written DR plans, what is the likelihood that their people actually have instant access to them? Not many. And finally, how many have the tools in place to execute on the DR plan? Even fewer. So, when a crisis strikes, most organizations are either too slow to respond or worse, respond in the wrong way. The reason is simple, in today’s digital age, disasters occur faster than ever and come from many different directions. The bulky 3-ring binder or huge SharePoint document isn’t enough. Christopher Britton, COO and the team at RockDove Solutions realized this deficiency between the planning, resources and readiness of an organizations people and supply chain to respond to a disaster, and developed ‘In Case of Crisis’—a crisis management platform. The launch of In Case of Crisis marked the inception of Florida-based RockDove Solutions. The company is uniquely positioned in the crisis management space due to its ability to assure organizations and their stakeholders’ easy, actionable access to DR plans combined with a powerful suite of communication and collaboration features allowing organizations to optimize the workflow and effectiveness of their response. In Case of Crisis, an award-winning smartphone-based platform transforms lengthy documents into actionable content to help stakeholders, supply chain executives, and other professionals respond to a crisis quickly and efficiently. It allows organizations to publish raw and location-sensitive content in an encrypted way and also accelerates the quality and speed of response in case of a disaster. In Case of Crisis is GDPR compliant and abides by the security standards of over 750 global enterprises including some of the largest compliant-driven institutions. 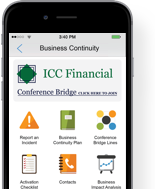 “We provide a powerful platform, designed for the digital age to allow organizations to better prepare for and respond to a crisis all from a smartphone,” says Britton. In Case of Crisis provides organizations an easy and effective way to activate their people, access actionable information and collaborate with their teams with private and shared checklists, secure chat rooms and more. RockDove Solutions assists numerous clients that are in need of providing their crisis management teams technology to respond faster and better to the myriad of threats they could potentially face. Britton recalls the tremendous impact of hurricanes that hit Texas and Florida last year and how RockDove Solutions’ clients were able to effectively use the In Case of Crisis platform to promote and ensure their employees’ welfare. Even during such a catastrophic event, the clients were able to execute on plans by roles and location, communicate with their employees, make sure basic processes could occur (i.e. employees collecting pay checks), keep customer support operations running, and track the welfare of employees in the affected areas. “Our strategy is straightforward. We continue to capture the critical workflow of our clients and their stakeholders during a DR event leveraging smartphone technology combined with enterprise-class security and world-class client support,” stresses Britton. The company is qualified and capable of helping organizations manage their DR plan in a highly flexible and secure manner irrespective of the number of employees. As a cognoscente of crisis management and a founding executive of In Case of Crisis, Britton believes increased integration of social media monitoring and early warning systems into the platform will help improve the workflows of organizations during disasters. He also looks forward to expanding on an executive dashboard for key decision makers such as CEOs and CFOs to get an insight into the incidents taking place in their organization. “We are currently seeing a great deal of adoption of our platform from organizations across the globe, and we want to live up to their expectations by continuing to provide the desired support efficiently,” concludes Britton. Read the entire post on CIO Review.